Generally, when I’m in the kitchen, there’s something playing on the ole Victrola in the background. I think certain music goes with certain meals. Making crepes? Edith Piaf. Meatloaf? Meatloaf. 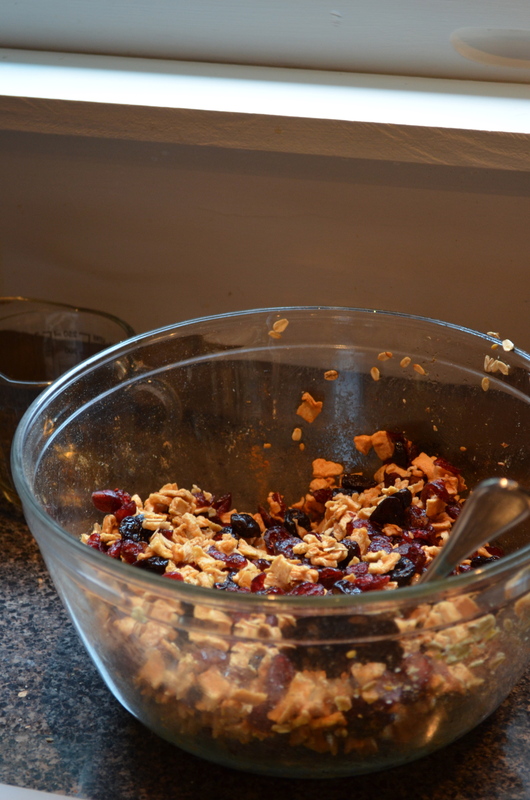 So, when I’m making granola, you can bet that I’m listening to NPR. Nothing gets me all fired up for some hippy staple like hearing Terry Gross ask pointed questions about dolphin massacres in Japan, the Bush administration’s policy on enhanced interrogation or Colin Firth. 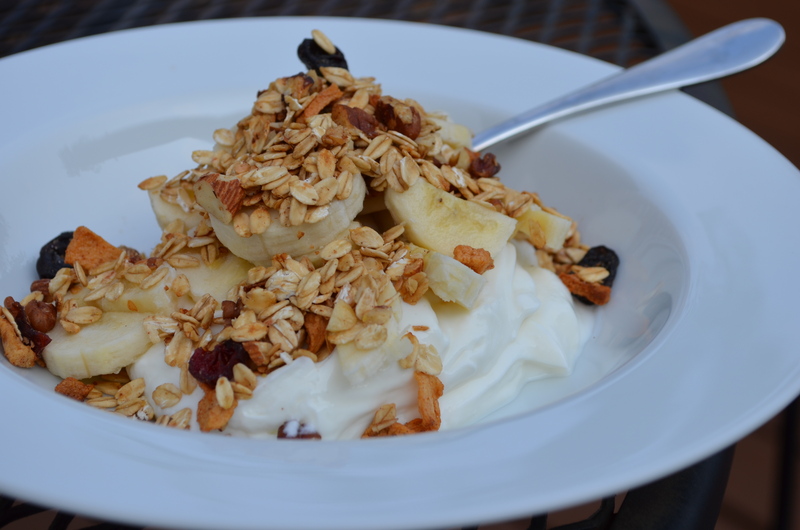 I’ve eaten the same breakfast almost every day for the past 10 years – yogurt and granola. It’s my go-to, especially when my bacon vending machine is running low. I got to a point where I figured I was depleting our retirement savings on Kashi products and so I decided that I should make my own granola. For the most part, I’d say it’s probably cheaper although there’s a real premium on nuts these days (note to self: consider becoming pecan farmer not only for access to delicious nut-meat but also for career advancement). HALT! 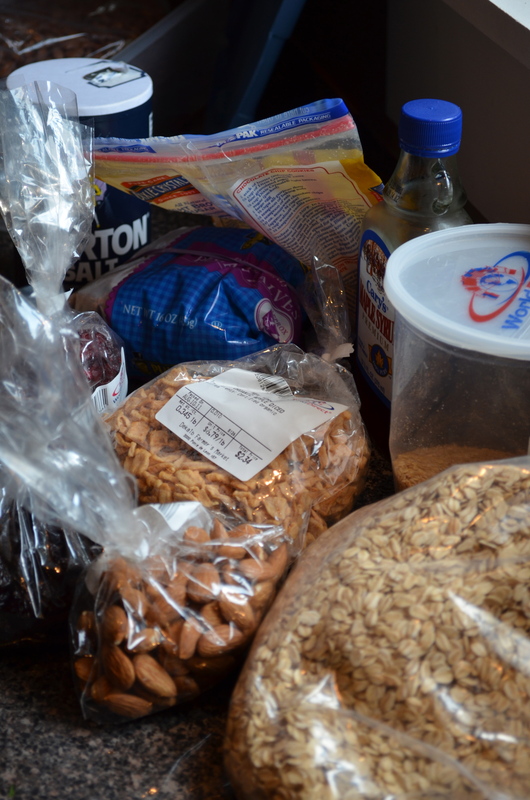 Before you go dumping all of this into a big bowl and cramming it in your (preheated to 375°F – whoops, should have said that 3 paragraphs ago) oven, I have perfected the granola so that your nuts and oats get crunchy and your fruit stays soft and chewy. You’re going to do this in two batches – the first oats and co., the second fruits-r-us. 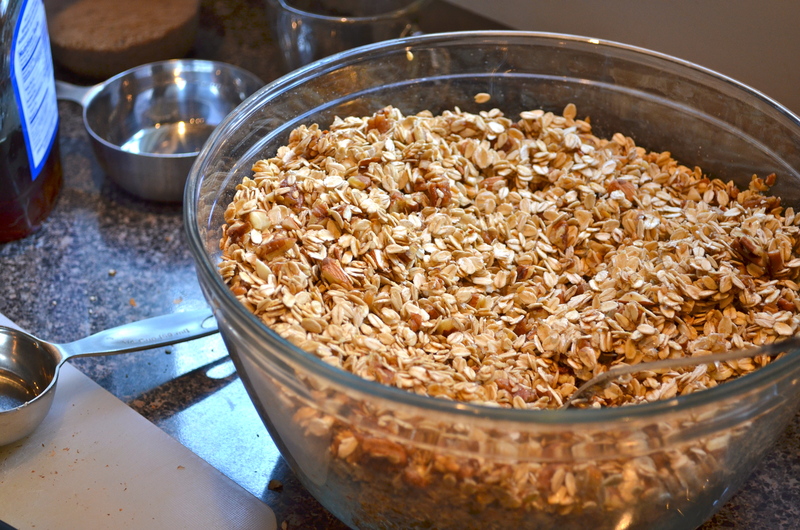 Mix the oats, almonds, pecans, flax seed, maple syrup, cinnamon, salt and brown sugar together in a big bowl. Dump that into a large, deep baking sheet (I use a Wilton cake pan that’s been in our family since the flood) and spread out in an even layer. Bake that for 20-25 minutes until the oats begin to get a bit of color and some of the moisture comes out. After it’s been in for the 20-25 minutes, pull your big sheet pan out of the oven and add the fruits to the oats, stirring everything together. Bake the whole thing for another 20 minutes or so until the fruit starts to puff up a bit and the oats and nuts are toasty. Once it cools, store it in a big jar or Ziploc bag in the fridge. This amount usually lasts about 2 weeks. I eat this with yogurt and half a banana while I compost near my Subaru while wearing my Toms. Seriously. Hi – I am a long time reader of your site. Do you have any hot dog recipes? Sorry you feel bad. My mom always told me that there wasn’t anything that a good hotdog wouldn’t cure. Hotdogs and Mayo. Yep that’s what my mom said. God rest her soul.